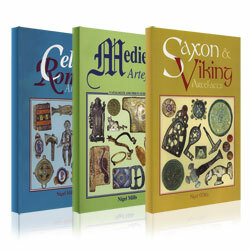 Medieval Artefacts - This indispensable reference book by Nigel Mills spans the period 1066-1500. It contains over 300 beautiful illustrations, all in colour, in 116 pages. The illustrations and descriptions will help you identify your finds and every item is priced in fine and very fine condition. The contents cover a wide spectrum of everyday objects including buckles, brooches, rings pilgrim badges, spoons, daggers, thimbles, weights, arrowheads, spurs, purses, seal matrices and heraldic pendants together with more unnusual items such as enamelled plaques from Limoges crucifixes.